I do not have time to take care of myself and this is something I am really trying hard to change it. It is not easy, I am sure you can guess that , but again the only thing we have to do is just decided it! We only need a few minutes every day and every night, a couple of beauty products just perfect for our type and we are done! Pure natural products are even better, my new love I have to say, and when I received a package with a couple of them, it was a love from first sight…or shall I say from first aroma? A product that should never missing from our collection is a makeup remover. Even if you are not the person that you use makeup every day, it is always good to clean your face before going to sleep. I had tried a few products so far, but the only problem was that they were making my skin dry. This do not happen with this makeup remover, which has almond oil and castor oil. The water from flowers just add a wonderful aroma. Because of the oils you do not need to use much of it, but just a few drops. Add it on a makeup remover pad, use it to clean your face and eyes and then just make for a minute a soft massage in your face. You do not need even to use a night cream, since your skin will become smoother and you will feel great in the morning. On Summer my biggest problem is my feet. After the Winter my feet are always dried and if I want to use my Summer sandals, I have to solve this problem. A moisturising foot cream is just necessary, especially to use it before going to sleep or after your bath. Problem solved with this body cream… I know, it is actually a body cream but I use it more as a foot cream. 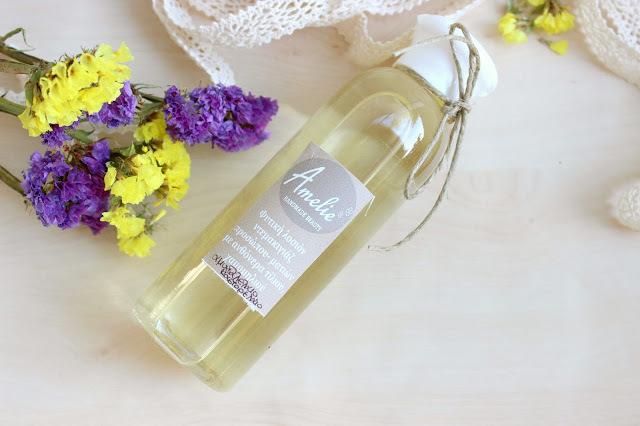 A pure natural product with almond oil, wheat oil and honeycomb just perfect to remove any dryness from your skin. Lavender and flower’s water just makes it’s aroma gorgeous! 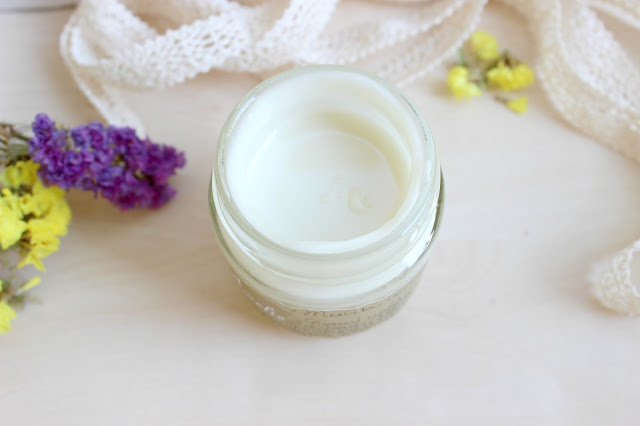 The proper way to use this product on your feet is to have first a relaxing foot bath, use a lemon and lavender sugar scrub and then add this cream. For a better result wear your socks before going to sleep. Of course this cream is perfect also for your body. Because it is so moisturising I use it for especially for the “hard parts” of my body, meaning the knees and elbows. Both of these products are natural and homemade. 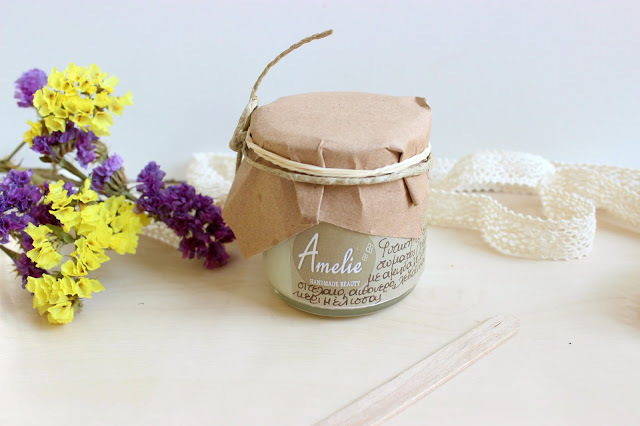 You can find them in Amelie’s HandmadeBeauty facebook page…. Actually you can discover more beauty products there and if you are looking for something specific or you need more tips for your skin, just ask Efstathia, she is always polite to answer your questions and to help you find your skin care product according to your type. Imagine that she made for my mom a face cream for her blotches which actually has a great result! So…what is the beauty product that never is missing from your collection???? ειναι! με φοβερο αρωμα και τοσο ενυδατικα! κανουν δουλεια Μαρακι! A! ενδιαφερον! λατρευω το αμυγδαλελαιο και πρεπει να τα δοκιμασω. Ήδη χρησιμοποιώ αμυγδαλέλαιο και κάνει πραγματικά θαύματα! 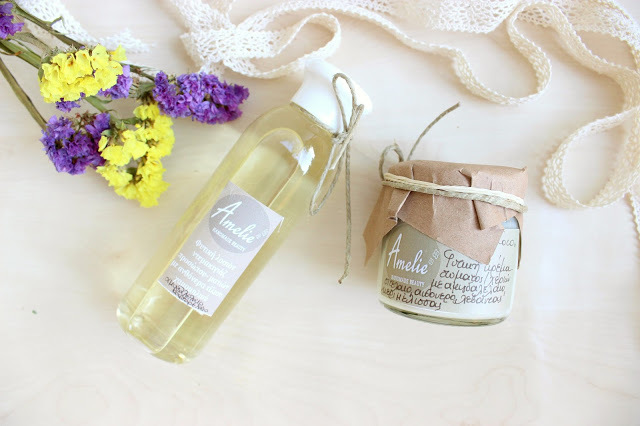 Amelie handmade beauty και τα μυαλα στα καγκελα!! !